Some of the world's biggest brands including Coca-Cola Enterprises, General Mills, Sony and Procter & Gamble are among a new wave of 114 companies that have adopted science-based carbon reduction targets that would save almost 800 million tonnes of CO2. 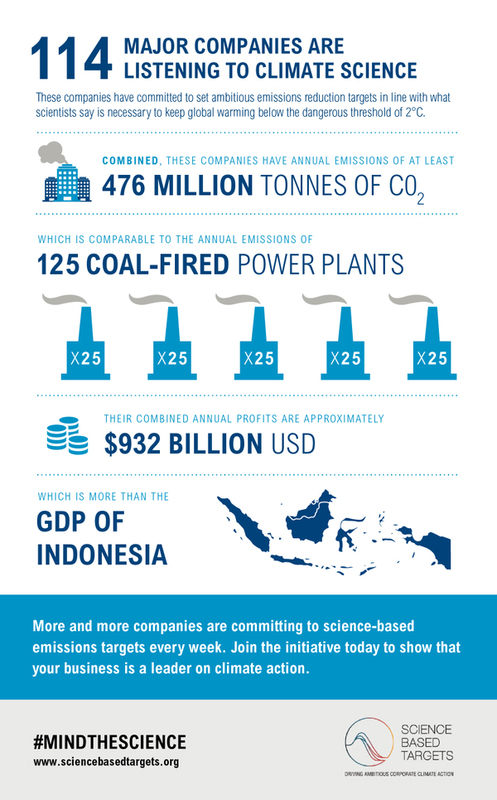 More than 110 companies, which are accountable for 476 million tonnes of CO2 emissions - the same as South Africa’s emissions – had their carbon reduction pledges approved by the Science Based Targets initiative at the COP21 climate talks in Paris yesterday (8 December). The initiative, created in collaboration with CDP, WRI, WWF and UN Global Impact, works with companies to adopt targets in line with the science on how to keep global warming below two degrees. These pledges mean the initiative has now exceeded its target of recruiting 100 companies by the end of 2015. It is believed the 114 combined pledges will save 799 million tonnes of CO2, if successfully achieved. Currently, 10 of the pledges have been officialy approved by the Science Based Targets initiative - Coca-Cola Enterprises, Dell, Enel, General Mills, Kellogg, NRG Energy, Procter & Gamble, Sony, Thalys and Pfizer. Among the commitments, Kellogg has set a 15% reduction in emissions intensity by reducing one tonne of CO2 per tonne of food produced by 2020. Absolute value chain emissions will also be reduced by 20% over the next 15 years. "Science shows that climate change will reduce food productivity and food security at the same time our world's population is growing and requiring us to feed more people with fewer natural resources," Kellogg's company chairman John Bryant said. "That's why Kellogg is working on multiple fronts to address the risks climate change poses. Today, we're joining others in Paris taking action to reduce greenhouse gas emissions to limit the earth's temperature increase to two degrees." Energy firm Enel - Italy's largest power company - will reduce its emissions by 25% per kWh by 2020 from a 2007 baseline. This will include decommissioning 13GW of fossil fuel plants with the aim of being carbon neutral by 2050. Enel's chief executive Francesco Starace said: "As a global energy company, Enel feels called to rapidly modify long lasting business as usual habits and take the lead in the fast transformation of the energy infrastructure, committed to reach carbon neutrality by 2050." Other commitments will see Coca-Cola Enterprises reduce emissions from its core business by 50% and from drink production by 33% by 2020. General Mills will reduce emissions from ‘fork to farm’ by 28% by 2025, and Proctor & Gamble reducing operational emissions by 30% in 2020. Sony will reduce its emissions from operations by 42% from 2008 levels with the aim of reaching 90% by 2050. NRG also has that same 2050 goal, with an intermediate target of 50% reductions by 2030. Together, the 114 companies that have agreed to these science-based targets represent $932bn with IKEA, Renault, PUMA and Walmart among the others that have committed. The Science Based Targets Initiative has said it will continue accepting new companies, despite exceeding its initial sign-up target. The commitment comes after growing concern that businesses could set timelines and targets of their own choosing, potentially limiting the climate mitigating effects of their targets. Business targets can now be tracked by the launch of WRI’s CAIT Climate Data Explorer.